A series of special events leading up to the 43rd annual Eclipse Awards, presented by Daily Racing Form, Breeders’ Cup and The Stronach Group, will benefit a range of racing-related charities, including the Gulfstream Thoroughbred Aftercare Program, the Permanently Disabled Jockeys Fund (PDJF), The Race for Education and the Grayson-Jockey Club Research Foundation, the National Thoroughbred Racing Association (NTRA) announced today. The Eclipse Awards will be held Saturday, January 18, at Gulfstream Park Racing & Casino in Hallandale Beach, Fla. Among the events that are open to the public during Eclipse Awards Week are a golf tournament at The Westin Diplomat Golf & Tennis Club on Tuesday, January 14, that will benefit the Grayson-Jockey Club Research Foundation; a celebrity poker tournament at Gulfstream on Thursday, January 16, to benefit the PDJF; a Ladies Luncheon on Thursday, January 16, to benefit the Race for Education; a ThoroFan Breakfast, featuring several racing luminaries and a day at the races on Friday, January 17; and a cocktail party at Gulfstream on Friday, January 18, to benefit the Gulfstream Thoroughbred Aftercare Program. The week will culminate with Saturday night’s black-tie-optional Eclipse Awards ceremony, hosted by ESPN’s Jeannine Edwards, featuring the announcements of Horse of the Year and divisional champions, as well as outstanding horsemen and media. 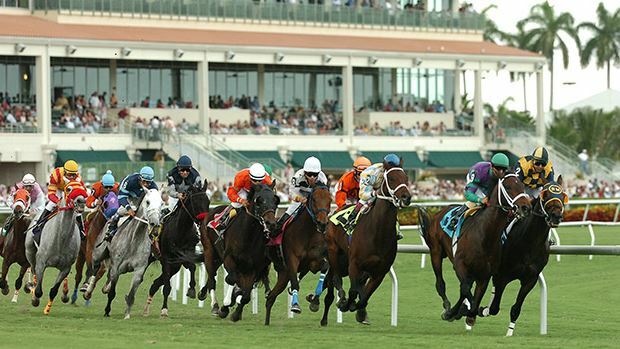 Racing at Gulfstream Park – Live world-class Thoroughbred racing at Gulfstream Park, highlighted by the Jan. 18 Sunshine Millions, featuring six rich stakes events. Where: Gulfstream Park Racing & Casino, Hallandale Beach, Fla.
Eclipse Awards Charity Golf Tournament – A scramble-format tournament benefitting the Grayson-Jockey Club Research Foundation, dedicated to funding equine medical research. Registration includes lunch, golf, cart, green fees, open bar and more. Additional prizes for Hole in One, Closest to the Pin and Longest Drive. When: Registration, 11:30 a.m.; Shotgun Start, 12:30 p.m.; Cocktail Reception, 4:45-6:15 p.m.
Where: The Westin Diplomat Golf & Tennis Club, Hollywood, Fla.
Eclipse Awards Ladies’ Luncheon – A day at the races just for women – sponsored by Xpressbet and benefitting the Race for Education and its Starting Gate initiative, a college readiness and reading program for middle school students – featuring lunch by Christine Lee’s, drinks, a silent auction, wagering help from a Daily Racing Form handicapper and more. Eclipse Awards Charity Poker Tournament – Compete against Hall of Fame jockeys and trainers, as well as other well-known racing personalities, in this live-money poker tournament with proceeds benefiting the Permanently Disabled Jockeys Fund (PDJF). ThoroFan Awards Breakfast – The second annual ThoroFan Awards Breakfast will honor Cot Campbell, founder of Dogwood Stable. Speakers include Mandy Pope, owner of champions including Groupie Doll and Havre de Grace, and William “Buff” Bradley, trainer of Groupie Doll. The program also features the announcement of the 2013 NTRA Moment of the Year and Horse Racing Nation Fan of the Year. Tickets include breakfast and seating for the day’s races. Eclipse Awards Celebration of the Thoroughbred – A private party for Eclipse Awards attendees to benefit Gulfstream Park Thoroughbred Aftercare. Register: Party included with Eclipse Awards ticket; open to public (with donation) after 8 p.m. The 43rd Annual Eclipse Awards presented by Daily Racing Form, Breeders’ Cup and The Stronach Group – Thoroughbred racing’s annual awards dinner with presentations for Horse of the Year, divisional champions, and outstanding horsemen and media. First Chance/Last Chance NHC Tournament – The top two finishers in this live-money tournament win the final two berths to the 2014 National Handicapping Championship, to be held the following weekend at Treasure Island Las Vegas (or, if already qualified twice, the 2015 NHC).